Game theory is a mathematical model for decision making that helps to understand how people interact in their decision making process. If applied correctly, I would make wonders and help us to predict the future in a greater extent. For sure this is not astrology. It is purely based on mathematical calculations. 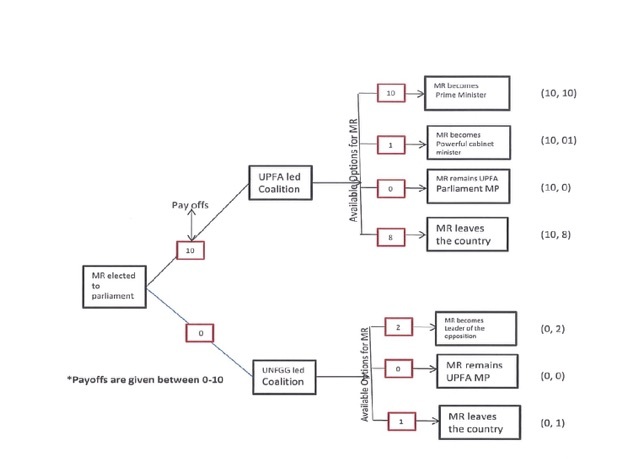 In this article I am applying the basic components of the Game theory and trying to guess how Mahinda Rajapaksa will react after the upcoming general elections. This game tree is set up on one fact that Mahinda Rajapaksa would be elected to the Parliament from Kurunegala district. In case if he is not elected to the parliament-something unlikely to happen, there is no need for game tree because there will be no more Mahinda. If UPFA secured majority in the parliament the best preference for Mahinda Rajapaksa is to become the Prime minister. This fact is well-known.in case if UPFA failed to secure the required majority Mahinda’s best option would be leaving the country according to this game tree. A question may arise why his next preference cannot be to become a powerful minister in the cabinet rather leaving the country. MR is the first president who is contesting for a parliament seat after the defeat in the presidential elections. Morally once a powerful man will not prefer to be subservient to another one who once was inferior to him. An executive president will never prefer to be in a lower position. If he chooses to become a cabinet minister he had to be always inferior to prime minster and the President. Any ‘would be’ Prime minister from the UPFA and the current president were once inferior to Mahinda. If UPFA wins he will vehemently try and exhaust all of his resources to become the Prime minister. If not possible he will leave the country based on this theory. If UPFA wins and MR is not elected as the prime minister his government will protect him from being convicted. Even though, he would prefer to leave the country rather than tolerating the shame and defeat of not being a Prime minister. He can demand a safe passage for him and his family to leave the country if UPFA fails to give him the premiership by threating to create a riff-raff in the country. Maithri who wants to get rid of him may agree to that. After the general elections we can see Mahinda’s faction will take extra measures, if required extra judicial measures to secure the majority. This period would be a festival time for small parties. And you will smell some under the table transactions as well. TNA, JVP, JHU, SLMC, ACMC are out of his reach. His focus would be on leftist parties and up country representations.at the same time he would have a serious internal rift between his and MS factions. You can see a tug of war in the near future if UPFA secures the majority in the upcoming General Elections. Convincing the president and his loyal UPFA reps will be a tough corner for Mahinda. Also he can expect some foreign pressures on Maithri not to nominate him as PM incase UPFA wins. First of all he has to win, then he has to make sure UPFA wins then he has to convince the party leadership to give him the PM. Surely he has a tough road to go even if he wins. What would be Mahinda’s choice if UPFA fails to secure the votes and UNFGG become the ruling party? On the first hand this would be a big disaster for him. Opposition is waiting till they get the majority to “take care of” Mahinda and his gang.in case UPFA fails to secure the majority in the parliament. According to the above mentioned game tree his first choice would be to become an opposition leader. He will demand that position. Because that will somehow save him from being investigated. Government may hesitate to take serious actions against an opposition leader in fear of future upheaval. Again this is a very tough task since the selection of the opposition leader involves other parties like TNA and JVP. If that fails MR’s next options will be leaving the country. Worse scenario would be Mahinda remains as UPFA MP in the opposition. Ranil may safeguard him from prosecutions as he did after MR’s defeat but he will not be able to do it for a long time. The best option for MR after the opposition leader would be to leave the country. Someone may argue what if he prefers to stay if defeated.it would be possible only with the patronage of Ranil Wickremesinge on the event of UNFGG becomes the ruling party. But that won’t last for a long time. Everyone is aware how he was creating ripples in the country after his defeat. This was silently dealt by Ranil since he didn’t have majority in the parliament. After he secures the majority there is no need for the government to tolerate MR. he will not chose to stay in the country after a second defeat which will bring more disaster for him.one may ask, then why didn’t he leave the country after his defeat in the presidential elections. Answer would be, though he was defeated in the Presidential election he thought he still had some remaining moves. He was expecting this parliamentary elections. After the parliamentary elections, he will not have a political future in Sri Lanka if UPFA doesn’t become the ruling party. If UPFA wins and he is not given premiership you can see a serious inner party conflict some time bloodshed as well. The supporters of MR may create mayhem in the country. During the fight for premiership if MR fails to secure him the prime ministerial post for him he will chose to leave the country since it is a puppy shame for him. If he wants to stay in this country he will stay in the highest power or he will leave the country. That is secure for him. If he remains non he will be in danger.so his thinking would be to do everything to assure the victory of UPFA and secure him the Premiership. If not leaving the country would be the best choice for him. If UPFA loses he would try to get the leadership of the opposition or will leave the country. Option one: if UPFA wins he will be either a prime minister or will leave the country. Option two: If UNFGG wins he will be the opposition leader or will leave the country. Among these what will likely to happen is the big question.it seems none of the major parties will get a majority this time. This will pave way for the minority parties to play a major role in setting up the government. Since JHU, ACMC, SLMC are with UNFGG there is a possibility the UNFGG may be able to set up the government. Having considered the hatred against the Mahinda Rajapaksa yielded by the JVP there is a high possibility that they will align with UNFGG if there is a fear Mahinda will become the prime minister if UPFA wins.in this case JVP may demand the UNFGG to take action against MR and his family corruption allegation if UNFGG wants JVPs support. The situation which prevails at the ongoing parliamentary election is not the same as the previous one. During the previous parliamentary election campaign MR was the president, he had all state media in his hand, state resources were on his back, state treasury was in his pocket, and armed forces were under his command. Today it is upside down and the challenges are more. President Maithripala’s wish for his defeat is a big blow for him and his party. He will be selected to the parliament but current situation is unlikely for him to be a prime minister. If he does not become a prime minister he will be dead meat, ashamed, irritated, and twice defeated. If UNFGG wins there are vultures waiting for MR. He may go for his first choice –to become the opposition leader-in case of UNFGG becomes the ruling party. In some extant this will save him for sometimes. Not in the long run. Rather trying to fish in the sand and putting himself at the cliff of the mountain it would be a good option for Mahinda Rajapaksa to negotiate with Maithripala and UNP and start packing his and is family’s bags and baggage. If he is intelligent enough he would chose to exit leaving the country on the hands of some who really want this country to become a good nation. But if he again and again craves for power and let his greediness cloud his intellect for sure he will meet a dead end and there will be no coming back.